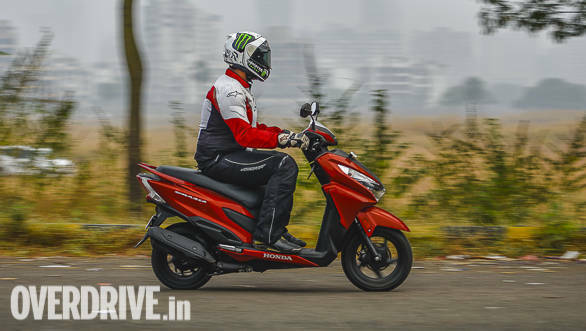 The Honda Activa is one of the strongest two-wheeler names in the country, but it is the Suzuki Access that has been more popular and also the highest seller in the 125cc scooter segment specifically, for a good ten years now. 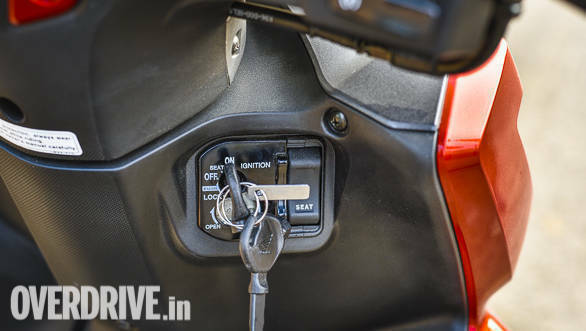 When Honda launched the Activa 125 it hoped to take the Access head on, but despite being a capable product it hasn't been able to stop the Access' charge. 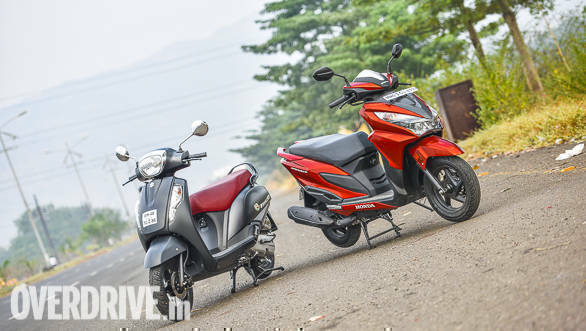 The Access has been received well by buyers across age groups, unlike the Activa 125 that's looked upon as a scooter for older, mature buyers. 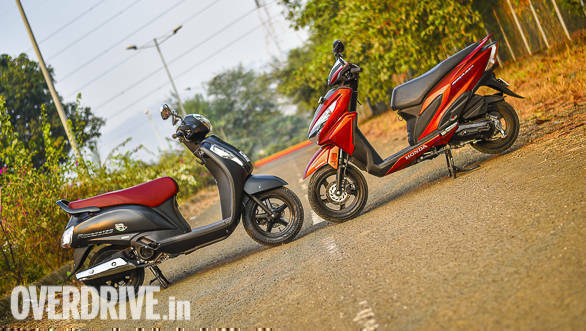 So Honda has just launched the Grazia, a snazzier, feature-rich 125cc scooter. Compare it to the Access we had to, the Suzuki being the king of the 125cc ring. If the Access is chalk, the Grazia is cheese. That's the difference in styling. The new Access debuted two years ago and is retro-looking and its appeal lies in its simplicity. The Grazia boasts a sharp, youthful design and even reminded me of the Dio. Particularly the headlights and turn indicators on the apron, the design of front top apron, the angled seat and similarly shaped rear. Viewed head-on, the Grazia is a handsome looking scooter. 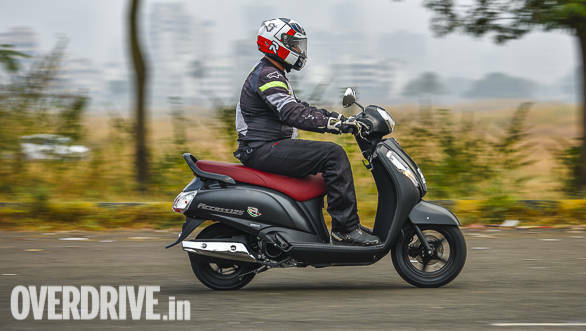 The all-LED headlamp unit is a first for a scooter in India and youngsters are sure to appreciate its milky-white light. The chromed headlight on the Access looks more conventional, while its long turn indicators make the front apron look taller. The Grazia's all-digital console looks cool with its multi-coloured backlights, and is a lot more informative. It also looks more appealing than the console on the Access which integrates a simple, large speedometer with a white background along with a small digital display. The rear ends on both are poles apart in terms of design as well. The Grazia's tail light and rear indicators use a sharper design and it also gets a snazzy looking split grab rail, while the Access gets a simpler, one-piece unit. The Grazia's end-can is upswept unlike the Access, where the exhaust is positioned horizontally. On the whole, the Access has a more universal appeal though and its styling has been received well. 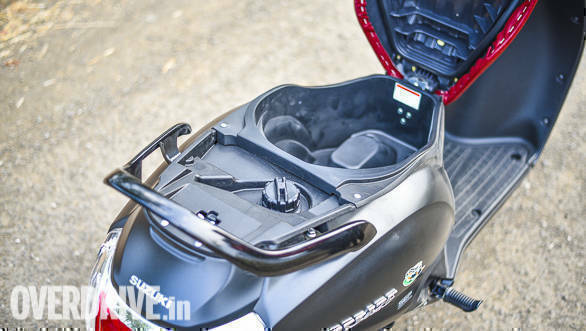 The Access also offers slightly better underseat storage space, though neither will hold a full-faced helmet. Both scooters use 125cc, air-cooled single-cylinder engines with similar outputs. The Grazia offers 8.6PS and 10.54Nm, while the Access offers 8.7PS and 10.20Nm. Interestingly, the Access is quicker to accelerate from standstill, though that's thanks to the fact that the Suzuki is lighter at 102kg as compared to the Grazia's 107kg kerb weight. The Honda offers a slightly better midrange punch though. So while the Access is quicker by a whisker when it comes to traffic light GPs, the Grazia comes back with slightly stronger acceleration when overtaking in traffic. That said, the Grazia's engine starts feeling stressed at the top unlike the Suzuki which feels relaxed even when pushing speeds. Coming from Japanese manufacturers of the highest repute both engines are very refined and feel smooth at all times, and as we have seen over the years both engines are extremely reliable. With that said, both scooters are matched evenly in terms of their powertrains. Being the newer scooter the Grazia is more up to date in this department. The star of its show are its LED headlights and digital console. Its display integrates a digital tachometer and a digital clock, both of which the Access misses out on. 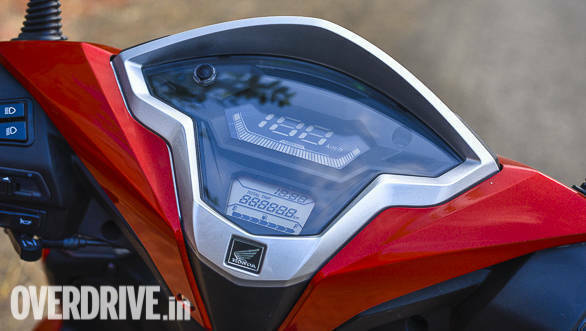 The Suzuki gets a simple looking analogue speedometer and a tiny digital display integrating the fuel gauge and tripmeter. The Grazia also gets three green lights at the top of the console that light up incrementally to tell you how efficient your riding is, though I'm not sure how many buyers will actually look down constantly to view them. Both get charging ports as an optional accessory along with pockets to hold a phone, the only difference being the Grazia gets a covered compartment. Opening the boot is convenient on both though the Access is slightly quicker  a twist of the key in the ignition slot itself will open the boot. On the Grazia you need to turn the key to the left and then press the doorbell like switch next to the ignition slot. Talk about ride quality and there is a noticeable difference. Positioned as a scooter for youngsters the Grazia's suspension setup is slightly stiffer to offer sportier handling, which affects its ride quality. When going fast over bumps and potholes the Grazia thus sends some of the thuds to the rider. The suspension on the Access is more absorbent and it feels cushier going over broken roads. The Access even feels more comfortable to sit on with its taller handlebar and flat seat. Its seat is also wider, longer and thus more accommodating and uses slightly softer cushioning. This helps it soak up bumps and potholes better while also making it better suited for longer rides. The Grazia's angled seat is in sync with its sporty design and is also stiffer and not as comfortable over longer durations. The Access has yet another ace up its sleeve though. Despite the softer suspension it feels as sporty as the Honda in terms of handling. The Access feels as confident, be it cutting through traffic or going fast around bends. The slightly softer setup in fact helps it feel more planted when riding fast on broken roads, as it doesn't get unsettled easily. Both scooters use telescopic forks and 12-inch wheels up front which makes them confident and fun to ride. 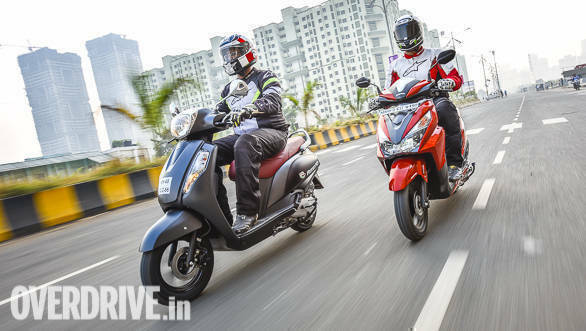 A front disc brake is offered as option on both and in our test we found the front brake on the Access to offer better bite, though the Honda comes equipped with CBS or a combined braking system, which makes it equally good to slow down. 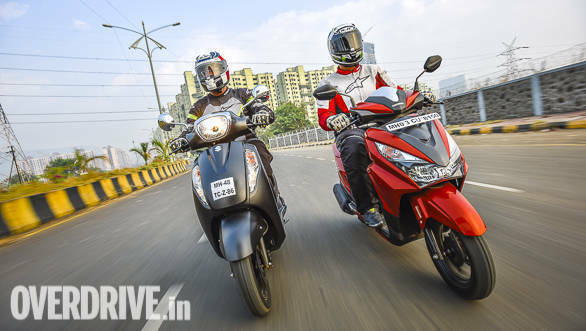 In terms of handling both are thus on par with each other but when it comes to ride quality, the Access clearly has an upper hand. The Honda Grazia is an interesting take on the 125cc segment, a space usually looked upon as more premium and upmarket. Honda Grazia tries to jazz up the space with its digital console and LED headlight, both of which are a first for the segment. Its overall packaging though is clearly intended for someone wanting a sporty looking, well-equipped scooter. The Suzuki Access on the other hand is simpler and more conventional, but that's exactly where its appeal lies. 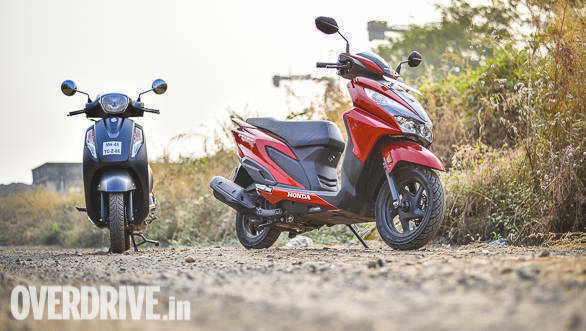 Despite its simplicity, the Suzuki Access does everything the Honda Grazia does with aplomb, while bettering the Honda on crucial fronts like comfort and handling. It also feels larger in size and as we have seen over the years it appeals to a wide range of buyers ranging from college goers to women and office-going executives to senior citizens. The Honda Grazia on the other hand has a lot more character, but its appeal is limited to the urban yuppie. The Suzuki Access thus comes across as the better all-rounder yet again, but what's even more impressive its lower price. The disc brake equipped Grazia retails at Rs 74,800 on-road in Mumbai, which is expensive for a 125cc scooter. The disc brake equipped Access on the other hand costs Rs 68,500 which is on the higher side too but is still 6000 rupees less. The Access thus offers better bang for the buck, also making it the winner of this comparison test.